Designed for the situations where just slightly more power is required over the MPPT12-1. 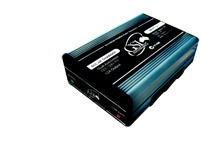 Capable of supplying 200W of power from 18V to 55V Panels into 12V batteries. This charger is a Cyclic charger and would not be suitable for charging batteries that are not in continual use. This unit is idea for camping/portable solutions and where limited space is available for panels.